Boston Seafood Shack: Lobster Rolls, and more! 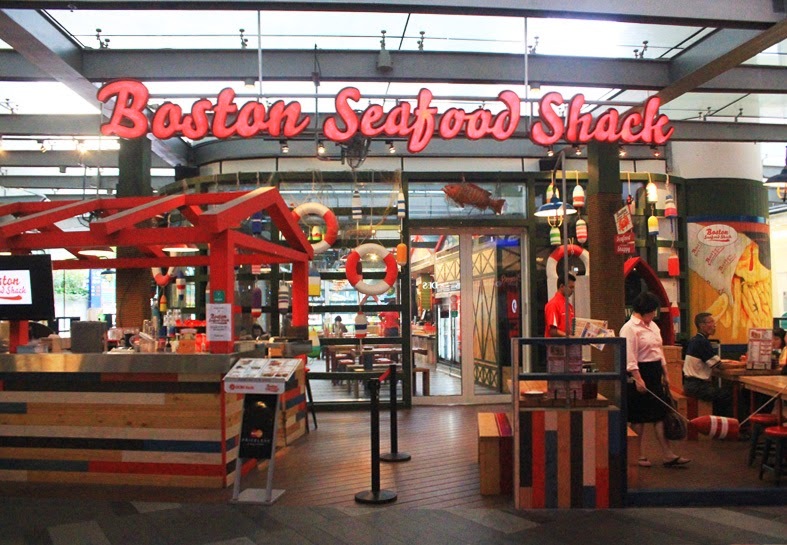 Located just beside the escalators, Boston Seafood Shack sits on the hot spot area in Star Vista. However, it could easily be the victim of "Let's look around first" and be neglected. For students, there's a student offer which my friends and I snapped up almost immediately. Students offer: $8 for main course of fish & chips/ mushroom pasta/ teriyaki chicken burger + soft drink, everyday before 6pm. No GST/Service Charge - double perks. If any of the other choices doesn't appeal to you, there are also other options available like the Seafood Platter. When I stepped into this restaurant, I was blown away by the details in the interior decor. Being a 'seafood shack', the design and decoration stayed true to its theme with many props hanging from the ceiling. The sunlight streams in from the glass above, but it is not too sunny as we chose a seat away from the glaring areas. There are two sections, one outdoor area and one indoor area. As it was quite humid, we were allocated an indoor seating with air conditioner. 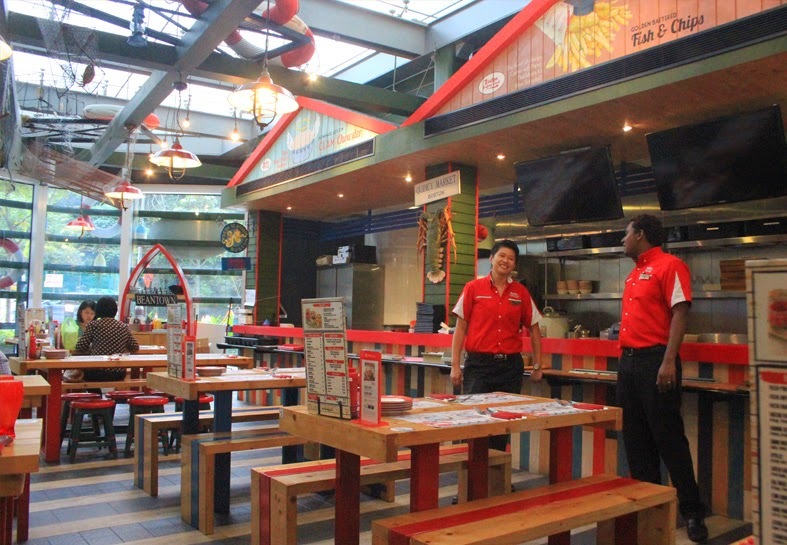 Even the counters area was painted with red, blue, black and white, a coherent theme with the rest of the restaurant. The outdoor area, suitable on windy and cool days. The place was generally quite empty. I pinched a serving of Fish & Chips from my friend! I liked the fries a lot, but it turned soggy after a while. The fish was really tender and it kind of melts in my mouth. I liked the Mushroom Cabonara Pasta because the mushroom taste/flavour permeates through the pasta/sauce as well. I refrained from choosing this because I know I can never finish these cheesy/creamy pasta, but I think this is not the overpowering creamy sort. I would order this the next time I come. My pick of the day was the Teriyaki Chicken Burger. There is cheese entirely melted within the burger itself which I liked better than the half-melted sort. However I find that the meat could be more tender than it is; the sauce could also afford to be more piquant. It is largely still quite satisfying but I don't like vegetables and they made the veggies inside really quite soggy and horrid (which I simply removed them from the platter). Among these three - the one I would recommend is the Mushroom Pasta. :) Hope this gives you some inspiration to eat here or cook something. This is an update on Boston Seafood Shack on their signature Premium Lobstah Roll ($18). This was found through the Sugar app which I previously introduced when I was at Buona Vista area. Instead of only a lobster sandwich as pictured, there is also a fruit salad and fries on the side as a complete meal. The lobster sandwich was generously stuffed to the brim with lobster meat and savoury mayonnaise.. very tasty indeed. The fruit salad was also quite special with a lot of different types of fruits like apples, pineapples, peaches with raisins too. These overshadowed the salted fries which were pretty good as well.